We’re going shopping at the Viejas Outlets and having a little fun at the Viejas Casino and Resorts in San Diego. This one is for adults only (21+). Dress your favorite ERA and lets groove down to the casino!!! Karaoke, Drinks for Sale, Raffles, Travel Games and Music from the 70s to the 90s. So bring your one item: Salt-N-Pepa jacket, cat-eye glasses, afro puffs, high top fades, etc. 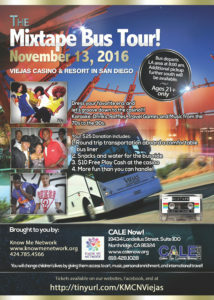 and GET ON THE BUS with Know Me Network and CALE Now! Pickups: LA and one location further south. Addresses will be provided to attendees. All funds go toward providing unforgettable experiences for young people.